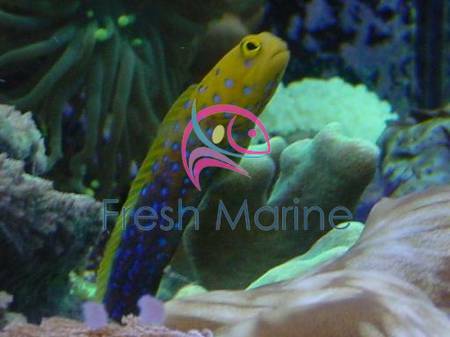 Size Shipped Range From 2" - 3"
The Bluespotted Jawfish is an extremely attractive fish. Its head is yellowish brown which gradually blends into a darker, almost black body. The long dorsal fin is yellow and the body is covered with large bright blue spots. There is a wide variance between specimens in how dark the body is. It is a very personable fish which often becomes the favorite of the hobbyists who keep it. Blue Spot Jawfish adds personality to the home aquarium as this reef-safe, colorful fish darts in and out of its burrow. Its constant observation of everything around its hole/home is reminiscent of Prairie Dogs on land. The most spectacular jawfish, the Bluespotted Jawfish is not as regularly to the trade available as its relatives, although we have them frequently. This unusual fish makes and interesting display animal. Keep with docile tankmates. Not aggressive towards other fish species, except those that try to enter its burrow. Can keep more than one in the same tank if aquarium is large. Jawfishes can easily jump from open tanks if frightened. Turn off the aquarium lights gradually can help to prevent jumping. Also less likely to jump after it has constructed its burrow. Provide with a thick sand bottom, mixed with pieces of shell and rubble to facilitate burrow construction. Males orally incubates its eggs; when they hatch the larvae enter the plankton. This species has spawned in captivity. Blue Spot Jawfish once established, it is fairly hardy and peaceful, except with its own kind and possibly with small ornamental shrimp. More than one should only be introduced in very large aquariums where each can establish its own territory. A few inches of soft substrate must be provided to allow the Jawfish to establish its home. Jawfish are notorious "leapers" and require covered aquariums. Reef Suitability: Bluespotted Jawfish are good reef inhabitants. Their burrowing habits require a deep enough substrate to burrow in. 3" is probably the minimum for them to be able to burrow reasonably well. Some authors state a minimum of 10" substrate, but that is not a requirement to be successful with this fish. Because of their constant desire to burrow, they may tend to bury corals which are placed on the sand and can make a nuisance of themselves. Temperature: Does well within normal reef tank temperature ranges of at least 76 to 84. Maximum Size: Blue Spot Jawfish grows up to a maximum size around 4 inches. Opistognathus rosenblatti is great for aquariums of any size, but should be introduced first if kept with fish that may pick on it. Feeding and Diet: They will readily take most meaty foods that are offered. Since they do not usually venture far from the bottom, the hobbyist needs to ensure that the Jawfish gets its fair share of the food. Many become quite bold and will compete well with the other fish for its food. A well fed Bluespotted Jawfish with have a noticeably plump, even bloated looking, belly after a good feeding. If the fish is shy at first and not feeding well, you should place some food down close to it using a turkey baster or similar tool. Blue Spot Jawfish are typically enthusiastic eaters who, as carnivores, like frequent feedings of meaty frozen foods, Brine Shrimp, and prepared pellets.